BENTON HARBOR, Mich. — A man who spent four years behind bars for a crime that he did not commit was featured Friday on a television broadcast with the officer who framed him to provide an example to the world of forgiveness and new life in Christ. In 2005, Jameel McGee was walking the streets of Benton Harbor when an officer accused him of dealing drugs. “It was all made up,” McGree told CBS’ “On the Road” with Steve Hartman. Officer Andrew Collins arrested McGee, who then spent the next four years behind bars before eventually being exonerated. He lost everything in the meantime and had to rebuild his life all over again. Collins, who was later caught and spent a year and a half in prison for filing false police reports, admits that he framed McGee. “And in the end, you put an innocent guy in jail,” Hartman said. McGee was so upset about the false arrest that he determined that when he was released from prison, he would find Collins and do him damage. “My only goal was to seek him when I got home and to hurt him,” he recalled. 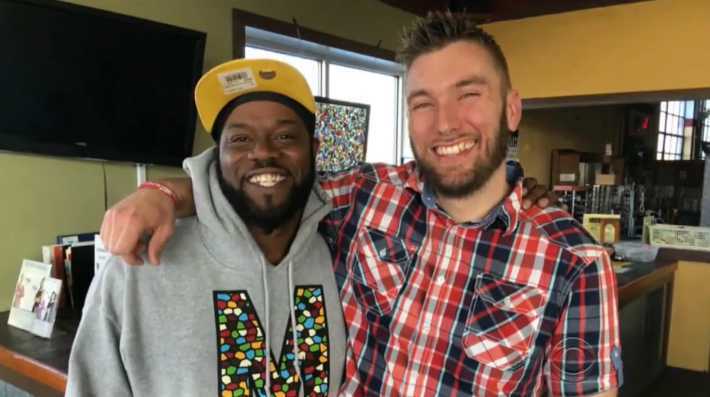 While they went on with their lives after reentering society, in 2015, Collins and McGee found themselves both working at the faith-based Cafe Mosaic in Benton Harbor. It was there that McGee confronted Collins about the false arrest. “I said, ‘Honestly, I have no explanation. All I can do is say I’m sorry,'” Collins remembered. “That was pretty much all I needed to hear,” he said. The two have now become close friends and spend time together even outside of work. One day, McGee told Collins that he loved him in Christ. McGee said that he wants to be an example to the world of a “kinder mankind” because of his Christian faith. He and Collins now speak at events together to tell their story and to talk about the importance of forgiveness and redemption.